This is yet another of Harry Stewart's creations that was developed for rivers of Eastern Cape. It not only proved to be popular with local fishermen who were catching monster fish with it but was also very successful when used on the fast flowing rivers of New Zealand. It is best used an hour before dark using a sinking, intermediate or Floating Line. I discovered that as well as an excellent river fly, I had created a great still water fly. It represents ANYTHING a fish likes! Body : Strip of Black Mink. 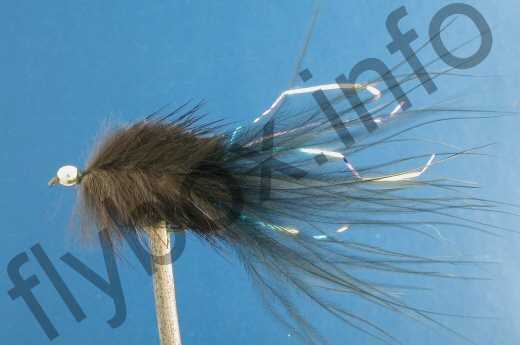 Tail : Black Marabou with 3 or 4 lengths of different coloured strong, narrow, flat mylar/flashabou. The weight problem was solved by using beads, copper, brass, silver or gold. I started off with a a strip of mink as a tail, plus mink wound around hook for body. I wanted to represent the tadpole. However it proved to be sluggish so to get more mobility I substituted mink tail with long marabou adding strands of flashabou. Currently there are no comments about the Stewarts Black Millionaire Taddy GH fly pattern from other fly fishermen yet.